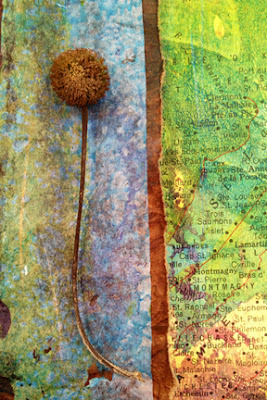 Lesley Riley's online class: Create with TAP Transfer Artist Paper is waiting for you right now at CraftArtEdu. 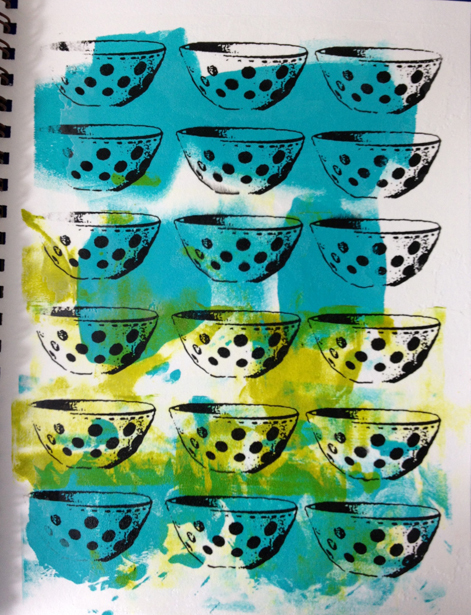 Learn to transfer to a variety of surfaces, including PAPER, FABRIC, WOOD, METAL and MORE! 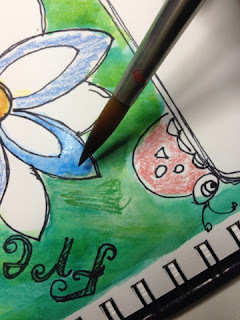 You've seen some of the TAP transfers I've done in my SKETCHBOOK here on the SB Challenge Blog, in my Bowled Over post. TAP transfers are WONDERFUL in your sketchbook. Sign up now and watch the 3 videos on your own schedule. It's available to you for a year. 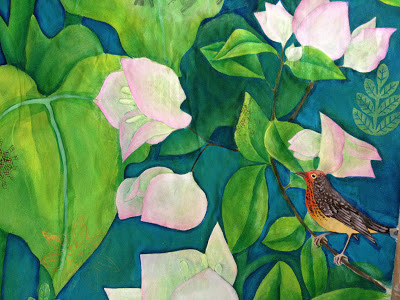 In person, you can find Lesley teaching at Art Unraveled starting July 29th, in Phoenix AZ. Click on the link for classes and information. Join Jane LaFazio at Art Walk San Diego, January 13-19, 2014, for 6 nights includes daily sketching and watercolor around beautiful San Diego, California. 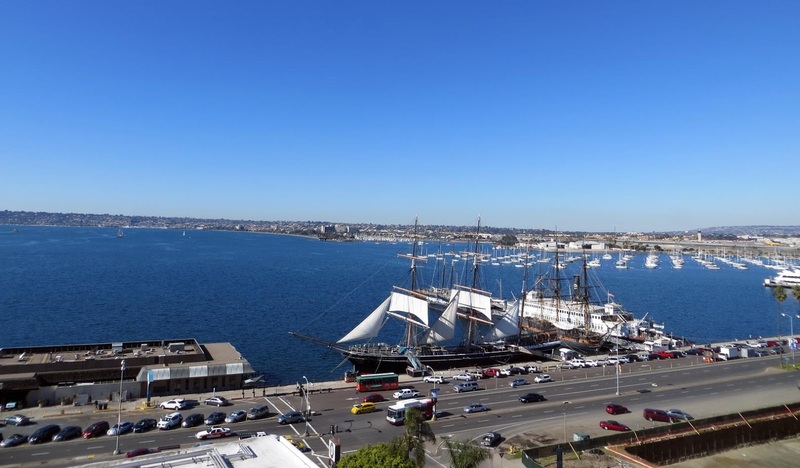 Includes hotel with a bay view, breakfasts, and many activities planned including strolls along the waterfront, Balboa Park, Coronado Island, Old Town, the Gaslamp Quarter and Seaport Village. We’ve included a hop-on, hop-off all day bus tour, as well as a trip by train up to the wonderful city of Encinitas. 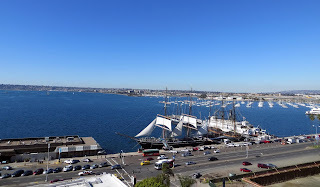 Friday night we’ll set sail for a harbor cruise around the San Diego Bay, including dinner onboard. Saturday, after visiting Little Italy’s Morning Market, we’ll spend the afternoon enjoying high tea at the beautiful Westgate Hotel. Details here. Or, join Jane in Italy in May 2014. Details here. Or, join Jane on the French Riviera in June 2014. Details here. Judy Coates Perez will be teaching Painting Imagery on Fabric and Fiesta Ornaments at Shake Rag Alley School of Arts and Crafts, in beautiful Mineral Point, WI, August 24 and 25. Historic Mineral Point is a wonderful artist colony in the rolling hills of Wisconsin 45 miles southwest of Madison filled with artisan galleries and gorgeous countryside. Check out my blogpost from the last time I was there. Mark your calendars International Quilt Festival, Houston, TX is coming up! And I have a full week of classes and an information packed lecture on Thursday, I’d love to see you there. 2 pm: New Class: Blog or website? Learn why a blog might be a better choice for you. As always, visit StencilGirl Products to see the latest offerings of stencils. 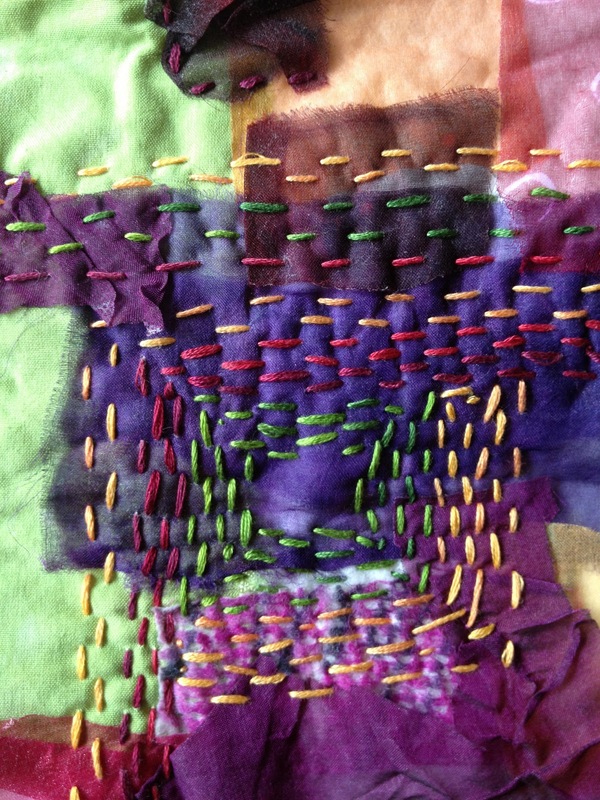 Jane Davies will be teaching at The Omega Institute in Rhinebeck, New York, September 22 - 27. 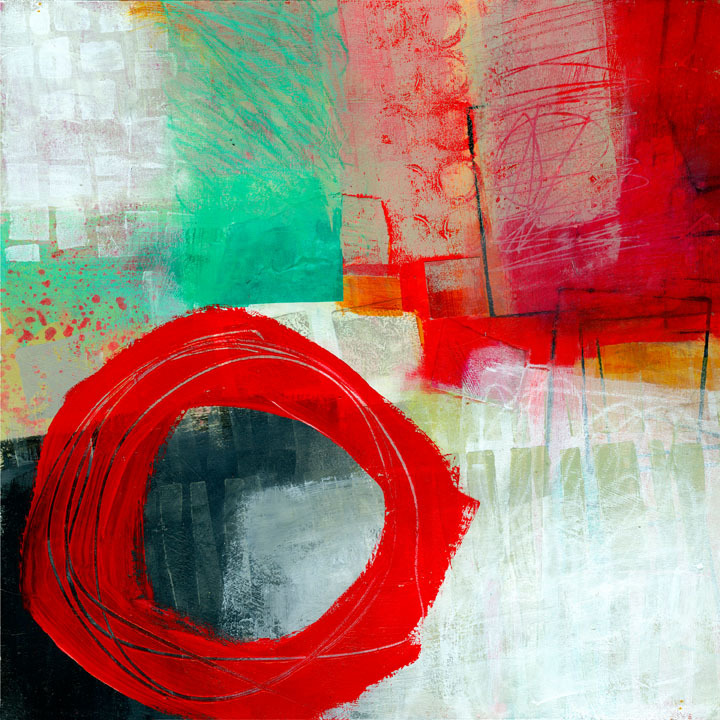 The workshop is "Expressive Collage and Painting: Finding Your Own Creative Path". Read more about it and see a video here. 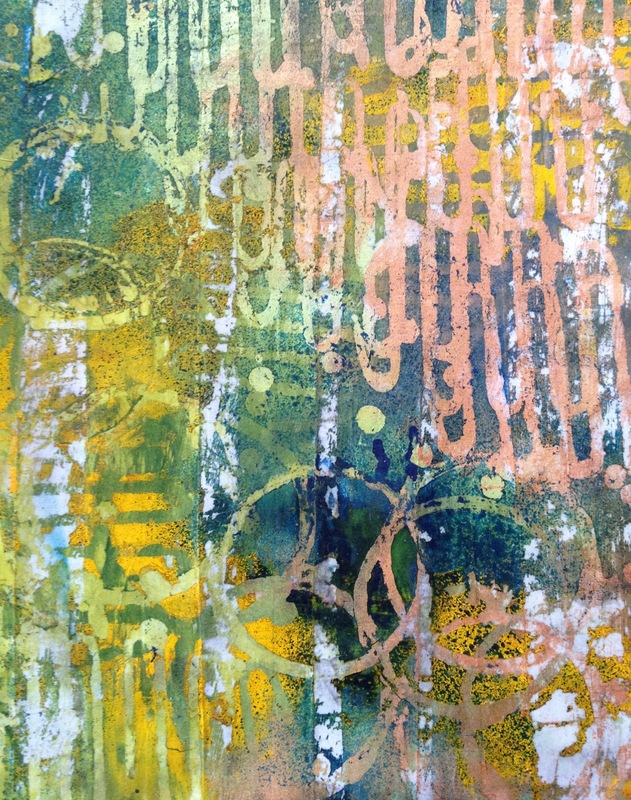 You can now buy prints of Jane Davies' work at Fine Art America. Mastering Twinks Sneak Peek from Dion Dior on Vimeo. Mastering Twinks Part I - Twinkling Discoveries is a glittering, shimmering journey into Luminescent Watercolors with Dion Dior. The summer session of this class begins on July 11th, 2013 and runs for 5 weeks, and once the class is complete, participants will have ongoing access for a full year. If you sign up anytime in June, you will go into the draw to win a beautiful "Twinkling Prize Pack". Dion Dior's Mastering Twinks series showcases Luminarte's beautiful Twinkling H2O's, luminescent watercolors, and takes you on a beautiful exploration into basic drawing, art journaling, and luminescent watercolor techniques. For more information or to register for Mastering Twinks Part 1 with Dion Dior, click here. 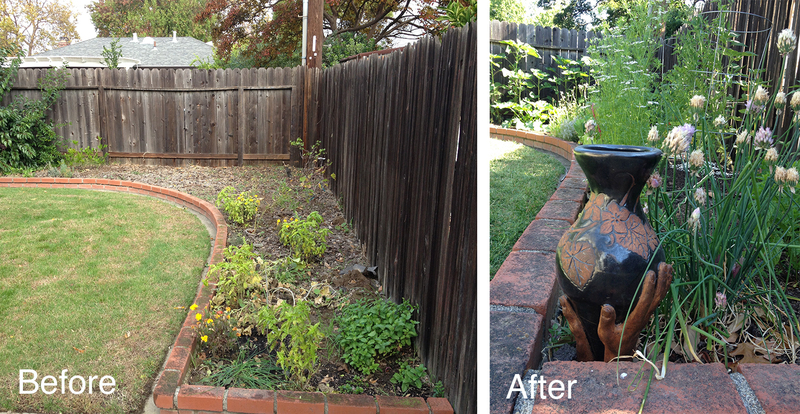 This is the first time I have ever had a garden. When I lived in Los Angeles I was really good at growing cactus and succulents, but was never very good at the kinds of plants that require any kind of maintenance. Looking back on it I can probably attribute it to being too busy raising small children, and using any available time to make art. Life is different now, my stresses have changed and I find a tremendous amount of peace and satisfaction nurturing my garden. 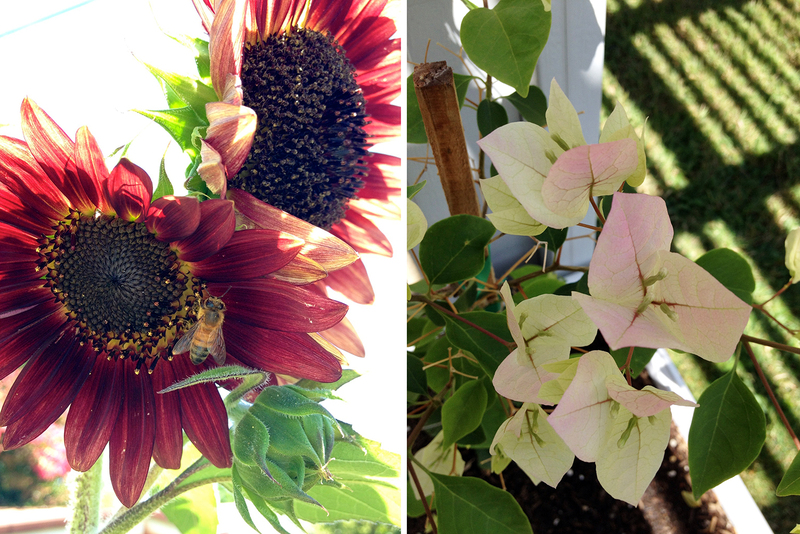 I'm amazed that not only am I able to keep these plants alive but also see them thrive. I'm enjoying all aspects of this process; I get excited seeing the first little sprouts, photographing the unfurling, even learning how to install irrigation and finding new homes for wayward creatures. I love my winged visitors. 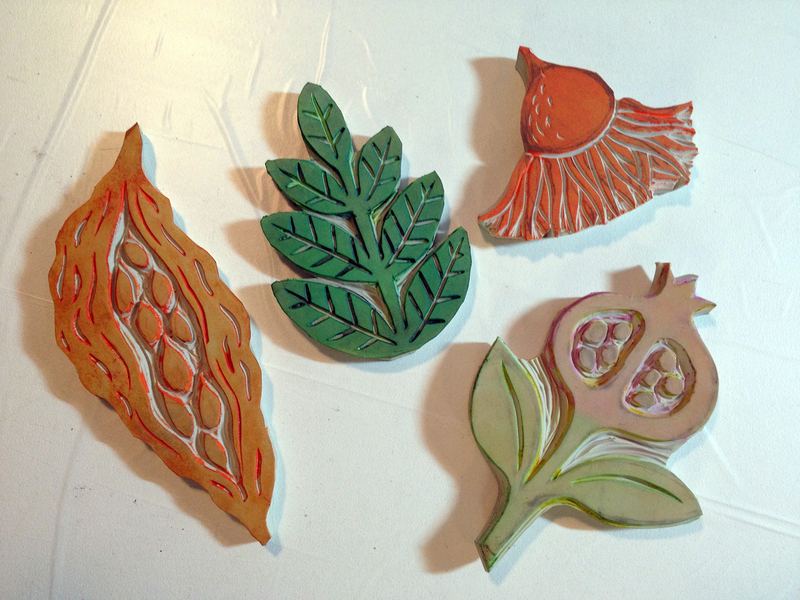 I've used a few designs to carve stamps to use in my work. I'm really worried about the bees. I have seen very few of them in my garden and I've noticed that some of the plants like my cucumber, beefsteak tomato, watermelon and cantaloupe are healthy and growing large but they are not producing fruit and I worry if it's because of the lack of bees. 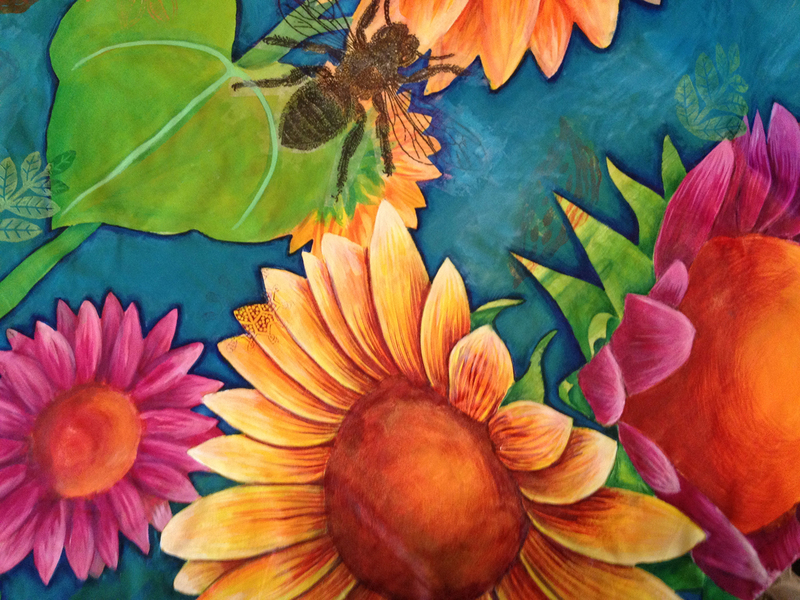 The vibrant sunflowers, pale pink bougainvillea blossoms, birds and bees have inspired me to paint this week. I have been working with acrylic inks on a large piece of cotton broadcloth. I'm not ready to show the whole thing because it's still a work in progress, but here's a few details. Dion Dior here. I love doodles and I love flowers, so I was especially thrilled about this month's theme of "Garden Doodles". 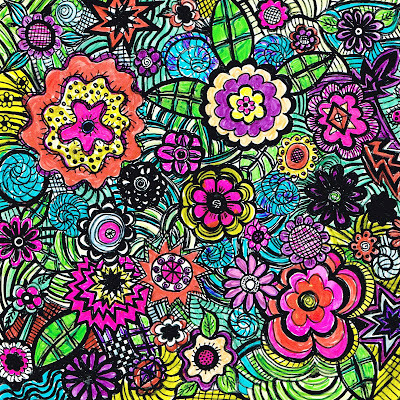 When I first started exploring sketchbook art with more focus, I spent a lot of time doodling. It's a great way to relinquish the pressure we put on ourselves to produce something that is considered perfect. And let's face it, very very few of us are able to produce perfect. 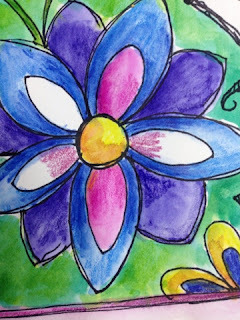 The freedom and looseness of doodling is extremely important to building confidence and creative expression. All good artists have books filled with scribble, doodles, and disasters, it's an important step to developing style and ideas for every type of artist. 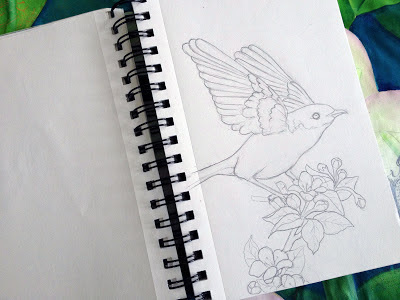 Doodling subjects that you find interesting is an excellent way to develop your drawing skills. 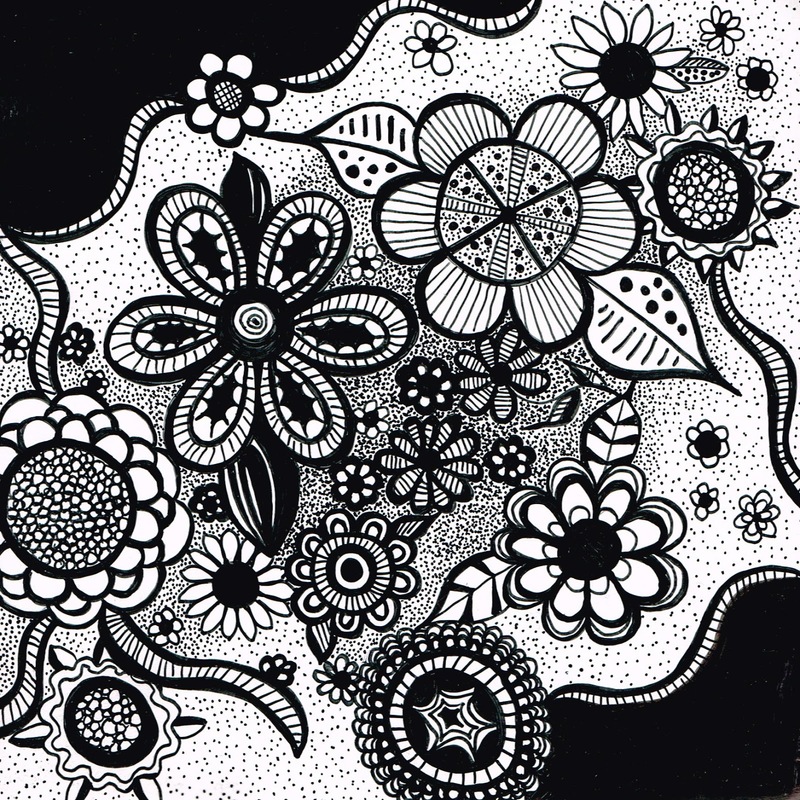 It is through doodles that we explore the shapes and structure of the things around us. 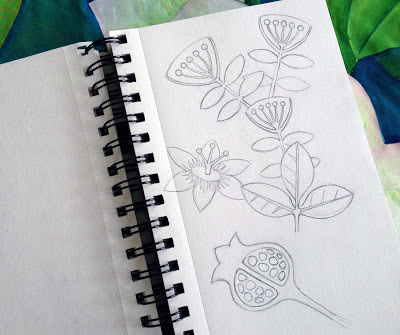 Flowers have always been a passion of mine, and by scribbling and playing with lines, I have been able to study flower shapes and composition. Doodling flowers is also an important vehicle for me to explore color. When I doodle, I move away from proportion and dimension and am free to take all the creative license I need to explore color. 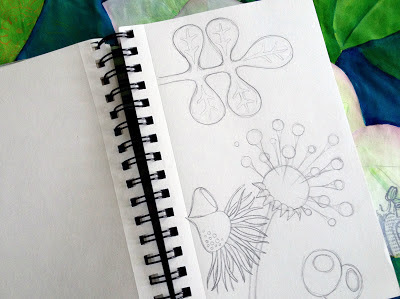 My sketchbooks are filled with flower doodles and patterns, some of them I transfer to larger works of art, and others just become illustrations for art journal pages or vehicles for my creative practices with different art supplies. 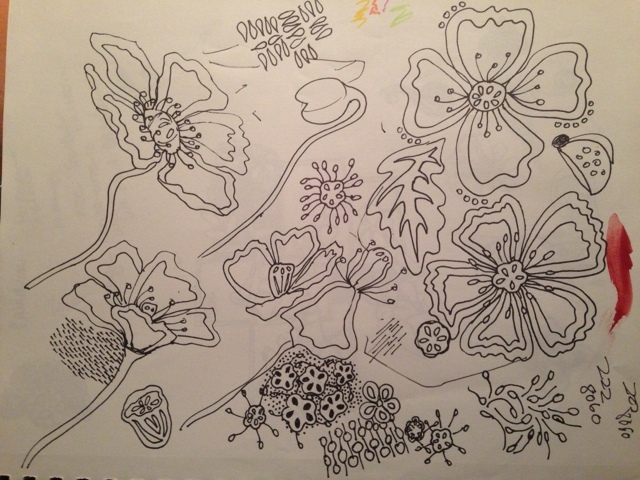 When you're struggling to find inspiration for your sketchbook practice, just put pen to paper and start doodling flowers...it's a very powerful exercise. Happy Summer from Lesley Riley. 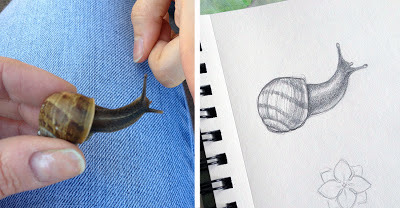 Last month at my Red Thread Retreat, we spent some time sketching outdoors under the guidance of our instructor and fellow Sketchbook Challenge contributor, Jane LaFazio. 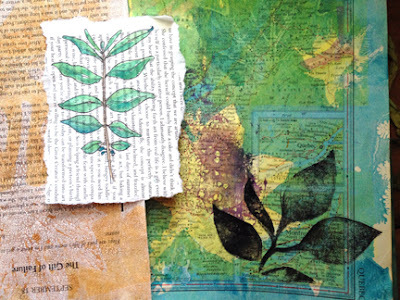 We celebrated and recorded the season using gelli plate prints on paper and fabric, sketching on a variety of papers, and adding layers of masking, stenciling and stamping. I particularly liked sketching on old book pages. The layer of text is a wonderful background for any drawing. And don't forget, you can also draw with thread. 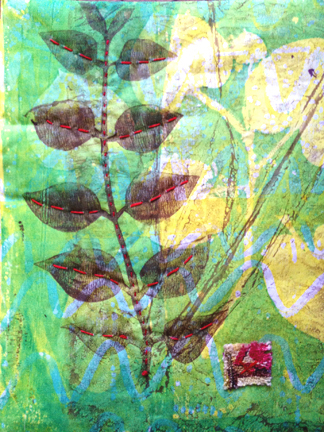 I emphasized the veins of the mono-gelli-printed leaves with stitch on this fabric I created to use as the cover of my hand-bound journal. As always, I carried away by color. I have always loved to doodle. For me, the most frequent way is using a small square of Fome-Cor and a Sakura IDentipen. There is something about the glossy surface of the foam, when paired with this permanent pen that wows me. I love the fact the pen has a skinny tip and a fatter tip. I have a bunch of Fome-Cor doodle boards scattered around my studio and in my backpack. They are great for travel. Just grab one board and one pen and you are good to go. This one is unfinished, I am still working on the background. Looks a bit obsessive, doesn't it. All I've got to say is that one person's obsession may be another person's comfort, you know what I mean. I particularly like to work on these doodles when I am in a group of people, everyone talking at the same time. That often means a family event. Oddly, I am the most quiet member of my family and anyone who knows me would never use the word quiet as a descriptor. So yeah, my doodles comfort me; they give me a wee escape hatch. When Joanne picked Garden Doodles I was delighted. I mean this is kind of what I do anyway, although mine aren't really based on 'real' flowers, they are imaginary. I decided to try something new though.......COLOR! Whoah! Kind of fun, huh? I think there might be more of this in my future. The color markers were a very inexpensive set called ArtMarker. They also have two tips. I got them at Michael's and they were quite inexpensive, but loaded with juicy color. 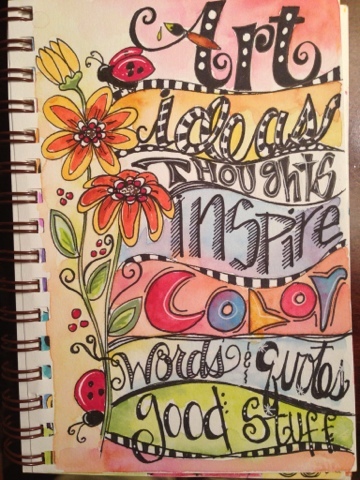 Desiree does Doodle and scribbles too! Hi everyone, Desiree here! I know that most of you know me as a fine artist, painting more on the realistic side but I do have a very active, fun and whimsical side. 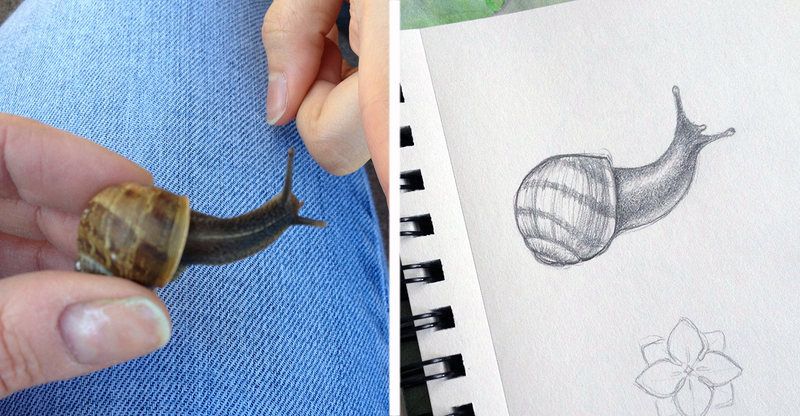 I love the opportunity to just sketch and doodle in the garden, looking for more abstract shapes and images. It is so relaxing to just take my sketchbook outside and enjoy letting the process happen, exploring different shapes, lines, combinations. 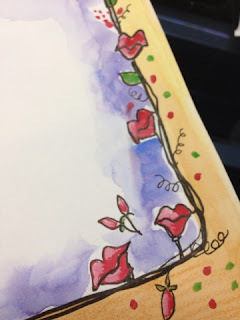 It is so different that painting a full watercolor painting, it is allowing yourself to explore the possibilities which may later become a painting. 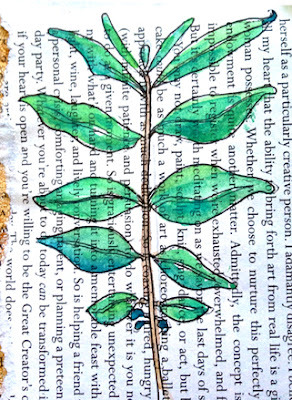 I have several sketchbooks for my gardens, taking notes about plants, plantings, growth patterns etc. a place to record information along with my thoughts when I am in the garden. It is a special time when I feel at peace with everything, in harmony with nature, at home in my special piece of dirt here on earth. 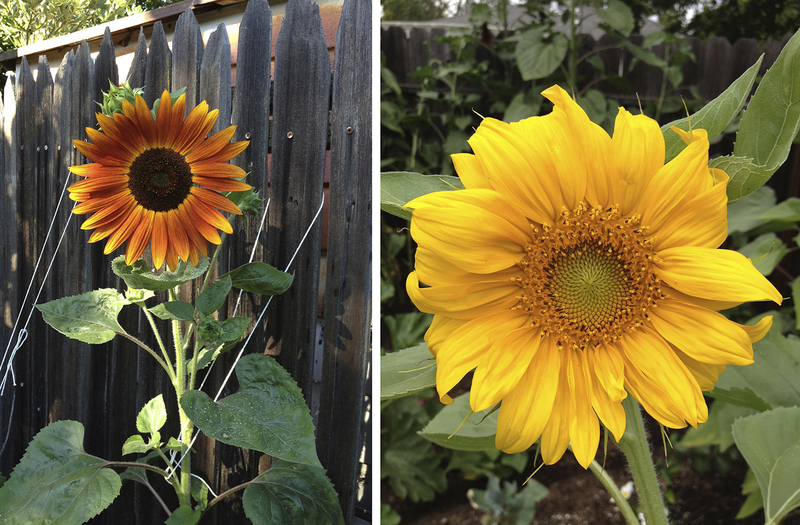 Growing the things I love, watching them bloom, enjoying the fruits of my labor. 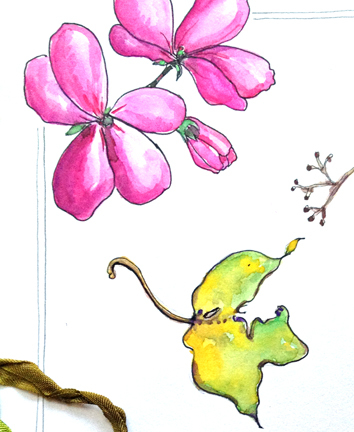 No matter how many times I draw the garden I discover something new! Sometimes I take one element and explore all the different and unique shapes that makes it what it is. I allow myself to just draw, not worrying about being perfect, organized and careful. Instead letting the paper beg me to fill it with all the different things that come to my mind. Often these shapes and designs will make it somewhere else, like fabric, stamps etc. 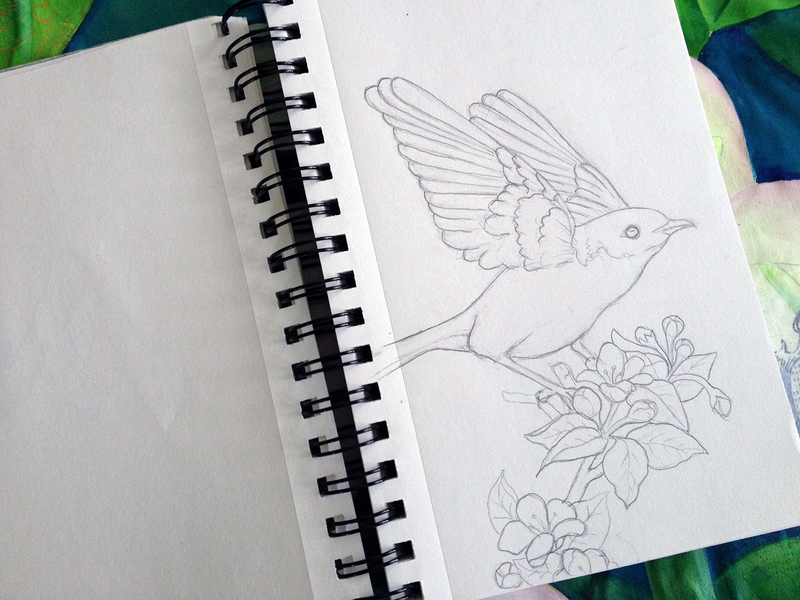 I always scan my designs as line drawings before I paint them. I have several folders full of them on my computer. 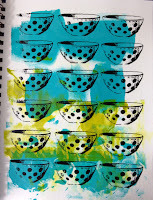 This allows me to print them up again and make changes without the paint and color. It makes things so much easier. I can select one element I like and using a program like photoshop or Photo Elements I can erase elements around it, copy, paste and make a whole grouping of them. It keeps my options open and saves me time. Once I have scanned something I feel free to just play with whatever tickles my fancy, paint, colored pencils, ink, markers. By playing we set ourselves free to discover something new and exciting. Here I am using water color pencils and some water to blend and create shadows. Watercolor pencils are easily transported outside and all you need is a Ninji waterbrush to activate the color! 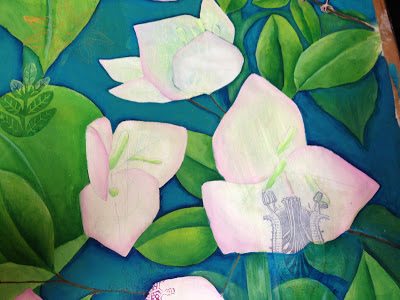 I love to layer them and get lots of color and variations on my paper. This was a worksheet I did for one of my classes, I used many different pencils, paints, pens etc to create this fun page. 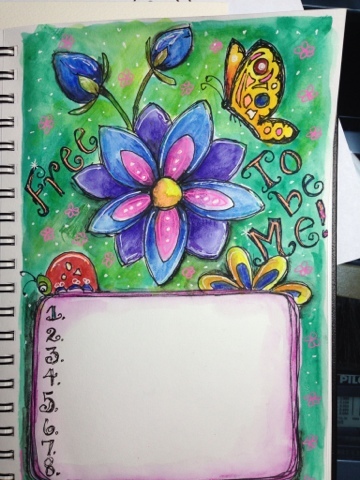 Here is another border I did for another worksheet. Making my flowers lips that only say lovely things. 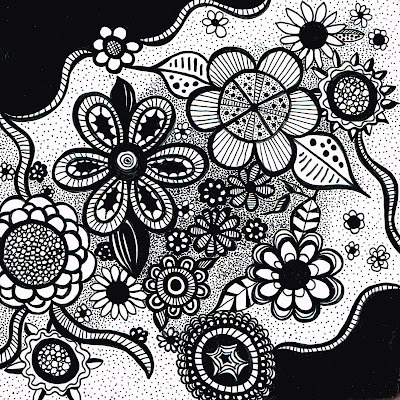 It was fun doodling my imaginary, whimsical garden. This is a page from my journal incorporating my whimsical garden and text from JoAnne Sharpe's awesome online class! If you can take one of her classes, you will not regret it! Playing with garden doodles and text is right up my alley. 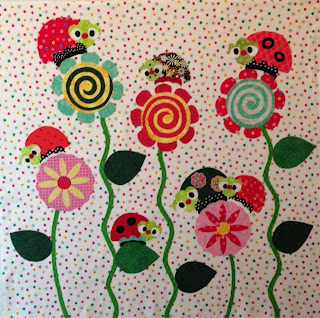 Often my garden doodles and sketches become the inspiration for new quilts like my newest baby quilt called "Ladybugs and Kisses". 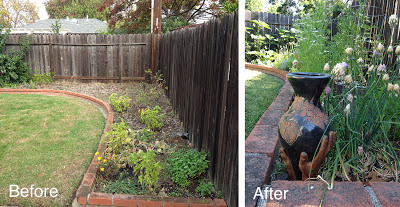 There are so many wonderful doodles in the garden just waiting to be discovered . So whatever or however you choose to capture your garden I hope you just enjoy the process and let the magic happen. Jane LaFazio here. 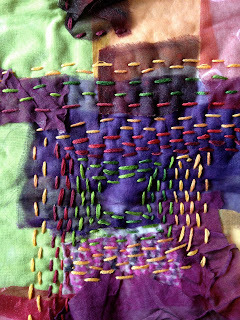 I enjoy doodling using my sewing machine and free motion stitching. I was inspired by Mola designs, and tried it using layers of felt.